TOYKO -- Nissan Motor Co. reported first-quarter profit that beat analysts' estimates as the company's operations recover from the nation's worst earthquake. Net income was 85 billion yen ($1.09 billion) in the first quarter ended June 30, a decline from 106.7 billion yen a year earlier, the company said in a statement on Wednesday. That compared with the 60.9 billion yen average forecast of six analysts compiled by Bloomberg. Japanese carmakers are coming back from the nation's earthquake on March 11, which damaged their factories and suppliers. Nissan, anticipating higher global production, had stocked electrical components before the March 11 earthquake and tsunami. That positioned it to raise production faster than Toyota Motor Corp. or Honda Motor Co.
"Nissan's recovery from the quake was relatively quick compared to its competitors Toyota and Honda," said Tatsuya Mizuno, a director at Mizuno Credit Advisory in Tokyo. "Growth in the emerging markets is still definitely strong." Nissan's global production rose for a second consecutive month in June after declining in April. The automaker's global output will exceed the previous year in all quarters, said Joji Tagawa, Nissan's corporate vice president at a briefing in Yokohama today. First-quarter production rose by 54,000 units to 1.037 million, he said. The automaker took a one-time charge of 21.1 billion yen in the quarter to cover the cost of repairing its facilities. The strong yen cut Nissan's operating profit by 55 billion yen in the quarter. Nissan based its first-quarter results on 81.7 yen to the dollar and 117.4 yen to the euro. Nissan reiterated its full-year sales and profit forecasts. Nissan's first-quarter profit would have gained more than 20 percent if not for the impact of the strong yen, Tagawa said. The profit decline due to the currency is "extremely regrettable," said Tagawa. The automaker doesn't plan to revise its yen rate assumption at this point and will decide whether to change its profit forecast after the first half, he said. Nissan has based its full-year outlook on 80 yen to the dollar and 115 yen to the euro. The carmaker's global auto sales rose 11 percent to 1.056 million units in the quarter, aided by a 23 percent gain in China and a 3.5 percent increase in the U.S. Japan sales dropped 15 percent to 118,000 in the period. Carmakers are hiring temporary workers to help fill back orders as suppliers recover. Toyota Motor Corp. is hiring as many as 4,000 workers as it prepares to ramp up production in October. Nissan has said it is hiring as many as 200 temporary workers to help raise output. Nissan shares fell 1.9 percent to 848 yen as of the 3 p.m. close of trading in Tokyo. The dollar has fallen 3.5 percent against the yen this month. The greenback slid to 77.70 yen today in Tokyo, the lowest level since March 17, on concern the U.S. will default on its debt and face its first downgrade in its top-notch credit rating. A stronger yen hurts Japan's exporters because it cuts the value of repatriated earnings. Nissan is reaching the limits of its efforts to combat the yen and is worried about the impact of the currency situation on jobs in Japan, Tagawa said. The automaker plans to introduce the new Infiniti JX crossover and Versa sedan in the U.S. this fiscal year that ends in March 2012, Tagawa said today. Nissan's Chinese venture said yesterday it will invest 50 billion yuan by 2015 to gain market share in the world's largest auto market. Dongfeng Motor Co., the venture, aims to raise annual vehicle sales to more than 2.3 million within five years from 1.3 million now as it increases the number of dealerships in China to 2,400 from 1,400, Nissan said. 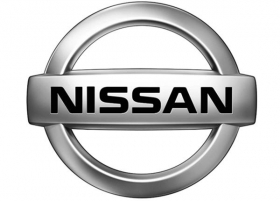 Moody's Investors Service raised Nissan's credit rating yesterday to Baa1 from Baa2, citing improved profitability, financial flexibility and global market position. "Nissan's production has recovered faster than expected and ahead of its peers," Moody's analyst Tadashi Usui said in a report. "Nissan will further and gradually improve its credit profile by maintaining solid profitability."